The flagship in the Bookeye® 4 family of book scanners is the Bookeye® 4 V1A book scanner. 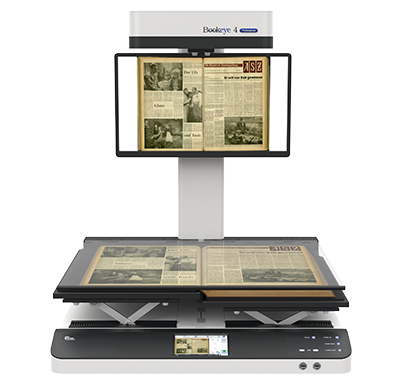 Scanning A1+ formats at 600 dpi scanner resolution, the Bookeye® 4 V1A features an automatic book cradle with up to 10 cm height adjustment, a glass plate that opens automatically and of course the 140 degree V-book cradle. Bookeye® 4 V1A is the world`s only working A1+ overhead book scanner that accommodates both flat documents - with or without the glass plate; as well as large, fragile bound documents, using the protective V cradle. Bookeye® 4 V1A is suitable for digitization projects that require high quality and maximum productivity even in 24/7 operation. Originals up to A1+, such as books, magazines, posters, folders or bound documents of all kinds can be digitized by the Bookeye® 4 V1A at high speed and a resolution of 600 dpi. Image Access has four powerful software packages in its portfolio for Bookeye® 4 V1A which enable optimal capture for large projects. Batch Scan Wizard, BCS-2 and Goobi UCC are designed to compliment the Bookeye® 4 V1A and can meet any requirement within a digitization project. Furthermore, the Bookeye® 4 V1A can also be used via the optional TWAIN driver interfacing with third party applications.